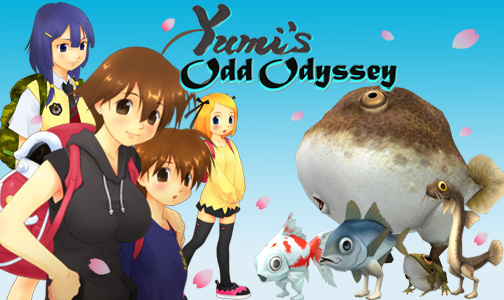 Welcome to the official discussion thread for Yumi's Odd Odyssey (Sayonara Umihara Kawase) on the 3DS! To start, please add this game to your log, add it to your collection (if applicable), and (when you are ready) rate it using the link above! It's out! Time to get in touch with your inner Schoolgirl Spider-Man. I've played it for about an hour so far, and I was a little concerned when the credits started rolling after just ten stages and one boss...but then I checked the manual, and there's apparently 50 in all. Gotta find some secret exits to get the rest, I guess. But hey, I'm a sucker for a good grappling hook, and the early going suggests the mechanic has some depth to discover. Anyone else digging in yet? I'm about 5 levels in and I am enjoying it. I have played the SNES (arrr) one and this definitely shows refinement in the physics. Fun game so far. I checked some videos for this and it... doesn't really look fun. Plus that style is not pretty. But yet people are enjoying it... so I'm confused. @VofEscaflowne It's definitely a very niche game. The niche being "difficult tether physics platforming" and also "fishing for legged sea creatures on dry land." I found a door (alternate exit?) in Stage 12 that's just out of my reach...can't seem to get the right pendulum swing launch from the nearby square. Or maybe I'm totally missing something else. I'm loving it. I've played about 20 stages and yet I'm at level 46, haha. Haven't seen the credits rolling. Yeah, the game doesn't look like much, but experimenting and getting good at controlling Yumi is definitely fun and rewarding. I can see why this is a cult classic in Japan. I thought the name sounded familiar. This is a sequel to one of Justin Carmical's favorite games! His video on the Super Famicom game made me want to play it, but that wasn't possible considering that I haven't modified my SNES to play Super Famicom games and copies of the game aren't cheap. I hadn't even heard of this release until just now. I'm tempted to check this out, but the $30 price tag is a bit intimidating. I'll have to see if there is a demo or something. If I disliked Bionic Commando (NES) but like the Grapple Beam in Super Metroid, would I still enjoy this? EDIT: Also, isn't "Odd Odyssey" redundant? EDIT 2: Apparently not--I always thought an "Odyssey" was a strange journey, but it could be any regular ol' non-strange one. Eh, ok - my interest in this just went from zero to, like 8. The cover art made me think it was a graphic novel! Here is a review by JewWario (RIP) that first alerted me to the franchise. It is a hard game to explain the gameplay to and it does look plain at first blush but it is a pretty deep game. That's the video I was talking about. So yeah, ended up playing almost 8 hours of this game the last few days...fun, addicting, and a good challenge. I think I've unlocked all but a few stages (and two of the boss battles) but there are still plenty of tough secret exits and backpacks to score. @Hero_Of_Hyrule For me, yes. But it's difficult to recommend to just anyone at that price. If you're looking for a wealth of content, you probably won't be satisfied. There's only 50 stages, and once you're good enough, they can be finished in an average of, like, 20-30 seconds. Granted, it'll take you several hours of trial-and-error learning with the tether physics to get that good. But it's a very unique game that provides an arcadey, physics-y, sorta puzzley platformer experience unlike any other game I've played, very different even from superficially similar games like Bionic Commando and Ninja Five-O and so forth. And hey, Natsume occasionally puts their 3DS eShop games on sale, so it'll probably see price drops every now and then. I've recently gone back to the game, trying to get more backpacks and alternate exits. Some of these levels are so hard! In level 11, I just can't for the life of me get to the regular door, after getting the backpack on that tiny floating platform. Is there a trick to it? Oh, maybe I mean 12. I'm at work and I can't check. Edit - Yep, 12. I can't seem to make the jump up to that second door on the left of the stage. @Guillaume Ah, yeah, that one. If you're trying to sling yourself up to it from the right side (where the tiny island is), you're doing it wrong: I think it's techincally possible, but extremely hard. Try going below, and remember that you keep your forward momentum when you land on ice. The solution is actually pretty easy to execute, it's just a matter of realizing what you can do in that situation. EDIT: Hahaha, I just realized I was having trouble with the same door earlier in this thread. Thanks for the tip! I probably would have kept trying accessing it from the right forever, until I got lucky or gave up.